But you don't understand. I am obsessed with chevron print! Ever since I moved to Los Angeles, my mind has been riddled with interior decor ideas. The aesthetic of my Tiny Closet really spans all corners of my life, needless to say I go simple and minimal. 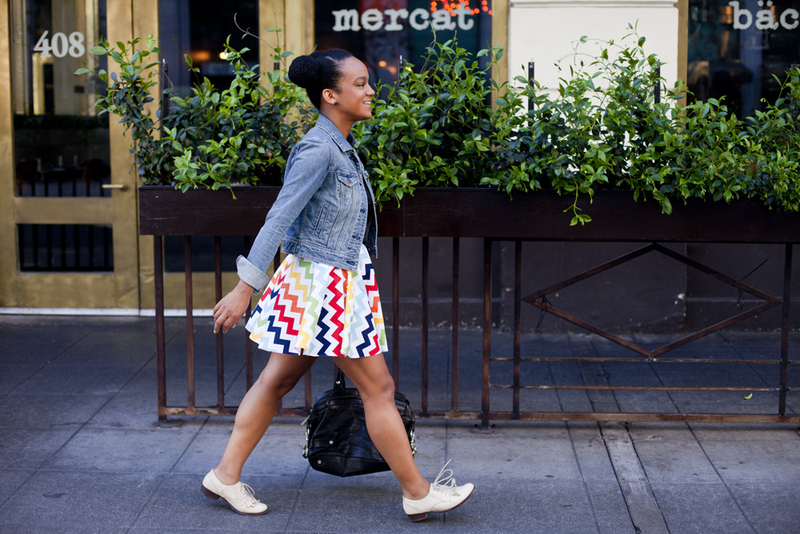 But I love pops of color and well-opportuned spaces for amazing print! While at the fabric store looking through upholstery fabric, I spotted an incredible collection of chevron prints. I knew I would have to give time for Theo to mull it over with his man brain (severely doubting his end answer would be "yes" to kelly green jumbo chevron striping for our couch *sniff*) so I chose to skip the inevitable compromise and headed to apparel fabrics to buy a cute and zany chevron print all to myself. But what would I make?? I rarely wear skirts. Come to think of it, the only skirt I do wear more often than not is a piece I actually made for myself. 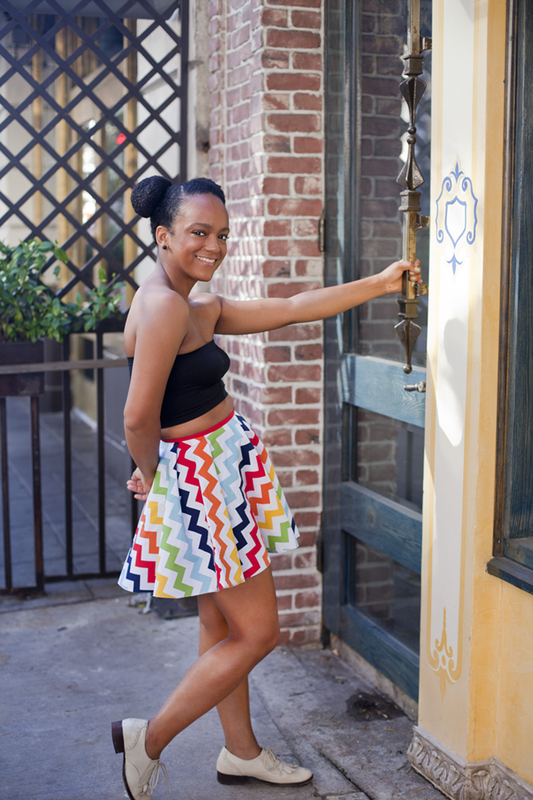 I am quite short and skirts never hit me right - plus I think I just don't like skirts so that's the end of that buuuut I adore this multi colored, chevron print skirt. I adore it to pieces!!! It was a bit too short, but I couldn't help the width of the fabric. No matter - I am wearing lil shorts underneath :) And speaking of playful, I decided to wear a lil bandeau under my denim jacket. Very Summery! This is a fabulous Spring/Summer item and, because it has gone over so well with my closet and was nearly a sinch to make, I will be making a couple more in equally playful prints. You should let me borrow that skirt, girl! Love your whole outfit and your hair is super cute! You are so adorable! Love the skirt. This is an amazing skirt! You've got skills, ma'am! That skirt is totes adorbs!!!!! I am obsessed with it. Seriously. Very sweet summery look. Love love love, that skirt! This is a lovely print and you wear it well. New follower via link love by Thriftanista in the City. Such a cute skirt! I love the shoes too! This skirt is too cute, I need one of these!! And I am loving your hair! !